Josh sprinted to 1st place in 50 Breast at UCSC’s T-Rex swim meet. The UCSC T-Rex long course meet was the last chance to qualify for Alberta Age Group Trials for some Riptides and a final tune up for others that have already qualified. Emiko led the girls with six 1st place finishes and 5 new club records. Shallis qualified for Age Group Trials with MQTs in the 200 and 400 free! Cassidy took 3rd in the 400 free and swam 5 personal bests. Avi dropped lots of time, swam 5 new PBs and her best finish was 4th in the 400 free. Avery came 3rd in the 400 free and 4th in the 200 fly and had PBs in all of her races. Kiana placed 2nd in the 400 free and had 4 top 10 finishes. Neo led the boys with four 1st, one 2nd and 4 new club records. He also swam the all-time fastest 100 fly by a Riptide! Pierre qualified for Age Group Trials dropping 70 seconds in his 400 free! Nick topped the podium in all four events that he swam. Josh won 1st in 50 breast, 3rd in 400 free, and 4th in 800 free. Domenic took three 3rd place finishes in 200 IM, 400 free and 100 breast. Alex swam to 2nd, 3rd and 4th place in 50 breast, 50 free and 100 free. Competing in the 11&U division, the 8-9 boys team of Anthony, Andrew, Kai and Leighton swam an amazing meet in the big 50m pool! Anthony got 5 personal bests and two 6th place finishes. Despite being only 9, he met three 11&U meet qualifying standards in the 200 free, 400 free and 200 IM! Kai swam 5 personal bests and with his best finish being 13th in the 100 breast. Andrew and Leighten both achieved 5 new PBs and dropped huge amounts of time. 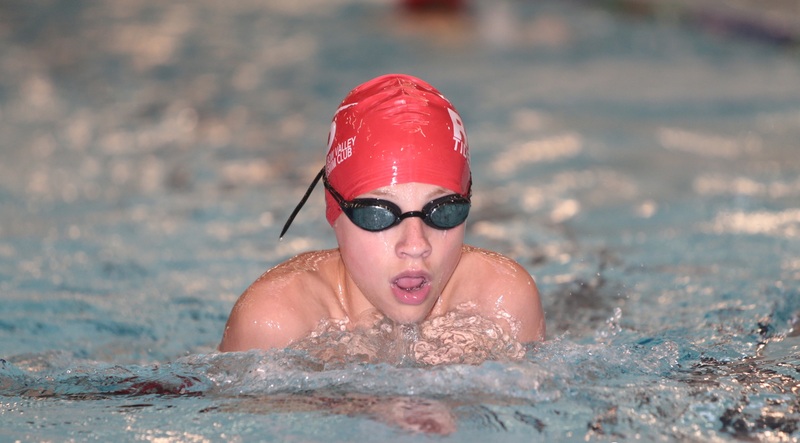 This entry was posted in Meet Results and tagged Alberta Age Group Trials, Records, Swim Meet, UCSC by bowvalleyriptides. Bookmark the permalink.